The Mathcad 2000 environment presents about thirty new functions. 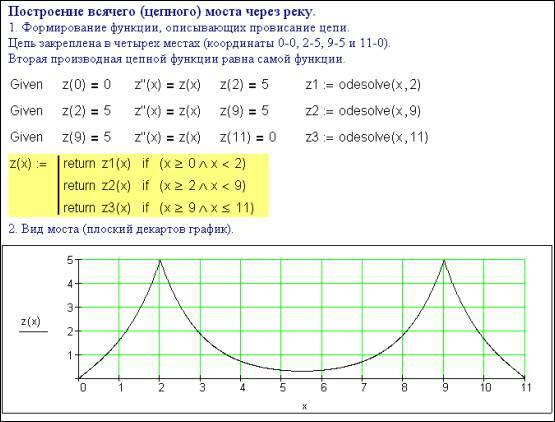 The most remarkable one is the odesolve function. It is unique for it does not return a scalar, vector or matrix, as with the remaining «normal» built-in Mathcad functions. Odesolve returns a one-argument function that is a solution of the ordinary differential equation (ODE). The ODE problem was being solved rather clumsily until the 2000 version of Mathcad. The eleven built-in functions (Bulstoer, bulstoer, bvalfit, Rkadapt, rkadapt, rkfixed, sbval, Stiffb, stiffb, Stiffr and stiffr) had been returning not a solution of the ordinary differential equation (i.e. a function reducing the initial differential equation to identity), but a vector of values that satisfy the identity equation. In order to define the solution function a user was forced to resort to spline-interpolation. The odesolve function, on the other hand, is at once «shampoo and conditioner»: it combines the numerical solution of the ODE (that is, the vector generation) and the spine-interpolation providing a definition of the solution function. The odesolve function has restored, in a manner of speaking, the beauty and naturalness of the solution process. Formally, the Mathcad 2000 environment allows similar solution of ordinary differential equations and algebraic equations – the task conditions are "gripped" between the keyword Given and the built-in function odesolve (or Find – speaking of algebraic equations). The task conditions comprise the differential equation itself and limitations reducing the task either to the Cauchy problem or to the boundary problem. Let's illustrate the "beauty" of the odesolve function by the good-looking graphical interpretation of its solution. In order to do this the «main» task should be considered: extend a suspension bridge across (over) the river, with the support cables fastened to a pylon at each edge of the bridges span. The differenctial equation describing the sagging chain (the chain function) is rather singular – the second derivative is equal to the function itself. Figure 1 presents a solution of the given boundary problem using a second-degree ODE. The result is the piecewise continuous function Z(x) allowing a carpet Cartesian diagram to be plotted – that is the suspension bridge half face. But the bridge design is especially solid and should be depicted with volume (three-dimensional) graphics. 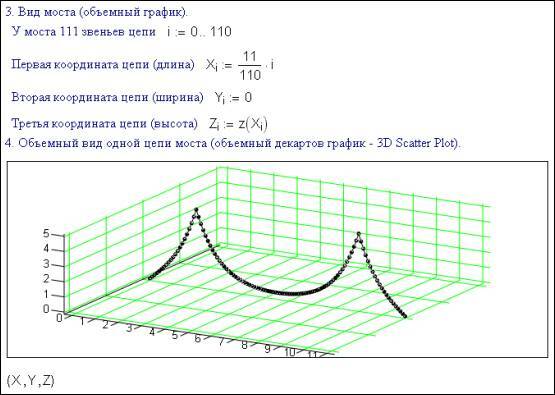 The Mathcad environment presents the three-dimensional analog of the Cartesian diagram, namely a Scatter Plot – «the strewing, dispersing graph». While the Cartesian diagram «operates» with two vectors, «dispersing» their values on a plane, the Scatter Plot requires three vectors (we define them as X, Y and Z), dispersing the coordinate points over a certain volume. The points can be connected with lines following either the point number (from the zero point to the first one, from the first point – to the second one and so on to the last point) or the values of the X, Y or Z vector elements. In addition, the points and the lines can be colored so that different hues depend either on the point number or on the values of the X, Y or Z vector elements. 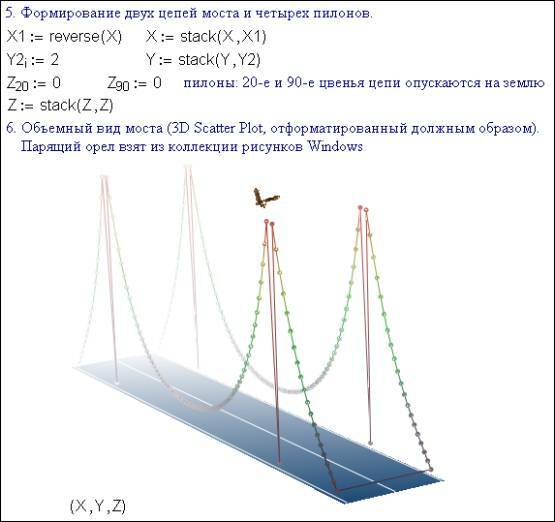 Figure 2 displays the bridge chain volumetrically from the viewpoint of the spectator, though the chain is oriented in the plane (Yi := 0). · The three-dimensional graph is formatted as follows: the axes and grids are removed; the chain is colored along Z-axis; the X-Y plane is filled depicting the roadway; three white grid lines are drawn on the Y-axis (that is the roadway marking); perspective and mist are added to make the design look more volumetric. The chain is fastened to four points (coordinates 0-0, 2-5, 9-5 and 11-0). The second derivative of the chain function equals the function itself. 2. The bridge appearance (plane Cartesian diagram). 3. The bridge appearance (three-dimensional graphic). 4. Three-dimensional depiction of the single bridge chain (three-dimensional Cartesian diagram – 3D Scatter Plot). At present computers are widely used as painter’s tools (an intellectual brush or something like that). Color printer listings are beautifully framed and exhibited at real and virtual computer-art salons, so to say. But the author would like to draw attention of respected readers to another problem. This is not simply the problem of computer pictures, but the program listing problem and, in particular, the author would like the reader to pay his attention to the problem of correspondence (or contraposition) of the listing form within the program contents. Astute programmers noticed a long time ago that procedures and functions have thier own «faces», allowing them to be recognized accurately when displayed or printed out. Some procedures are like well-groomed peasant horses, they are plump and sleek and just go on operating, for example, transferring data from one format into another. They are outwardly unremarkable – they do not attract rapt attention. Alternatively, other procedures always aim to spring a surprise, for they are so riddled with bugs (green) that they resemble a stallion saddled by the hero of numerous picturesque canvases and sculptures. There are other procedures just crying out to be framed and hung upon a wall for they are so beautiful and perfect. Thiershape entirely suits their contents. They transmit not only the thoughts of their creator, painter, or programmer, but also his mood and feelings. This author is far from being an art critic and does not dare to dilate much on the subject. Annotations to published computer pictures emphasize, as a rule, the authors to be computer artists. Semantic adjectives frequently hide certain defectiveness or, at least, ambiguity of definition: for example, there exists not pure mathematics, but «Applied mathematics". The term the computer artist is rather ambivalent. On the one hand, the adjective «computer» presents a kind of apology to a potential spectator for the picture aesthetics (see the bridge «picture»). And on the other hand, this adjective notifies a spectator of particular tools and methods (avant-garde pretentious novelties) applied at the creation of the picture. The real artist should be prepared to operate with anything and on anything. The pictures of Anatoly Zverev (the artist of a tragic destiny, that, alas, frequently strikes genius people; exhibition of his works took place in Moscow not long ago), that were drawn almost with a cigarette stub on paper scraps, and are now sold by auction at fantastic sums. Will printer listings ever be exhibited at the Louvre or at the Hermitage or, at the very least, auctioned off? Not Likely, because they can be sold on a diskette that was owned by the computer artist (but it is a fetish – guitars of grand musicians are now sold like that). In addition, computer art does not distinguish the original from a copy. This fact alone may kill potential masterpieces, which are sometimes published on magazine covers or inside glossy editions. Pushkin had been speaking: «That is vulgar – what is popular». Only the most ingenious artworks withstand the trial of being brought to the broad masses. And it is precisely these masterpieces that are of fundamental importance to the cultural stratum of present-day civilization. Guess what Pushkin’s Don Juan was speaking of! Quite so – he was also speaking of computer animation, of pictures created by means of computer graphics… Let's put it mildly (with a certain hope) – he was speaking about modern samples of the science, process engineering and art symbiosis. You see, computer pictures allow you to feel more an imperfect tool (fresh charm – is the paradox of high technologies), than the artist himself. The task is also analytically solvable, if it is remembered that second derivative of hyperbolic sine equals hyperbolic sine itself. Or the bridge «en face», just try to comprehend – is that the bridge half face or en face. The given vectors are not always evidently present. Fig 1 displays both argument x and function Z(x), but the Mathcad environment creates two vectors plotting a Cartesian diagram – it creates a vector of point coordinates and points blend into a line on the diagram. It is meant a pseudo-volume of course – display still stays plane. The Mathcad environment presents special tools enhancing image voluminosity and we will use them. The environment allows various coloring systems: rainbow, topographic and so on. If the vector X1 is not reversed «headlong» (X1 := reverse(X)), the two bridge chains would be connected with a line crossing the roadway diagonally. And our line crosses the bridge entrance like a ribbon to be cut at the bridge unveiling.